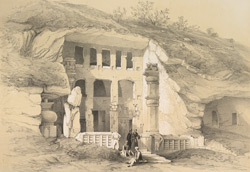 This is plate 15 from James Fergusson's 'Illustrations of the Rock Cut Temples of India'. Kanheri near Bombay was a flourishing Buddhist site for nearly a thousand years. The great chaitya (prayer hall) there dates from the second century and has very similar features to the famous one at Karli. The rock-cut wall of the exterior is flanked by large columns with sculpted bases and capitals. The facade of the hall has three doors and the window above is an unadorned semicircular opening. The large reliefs of the standing Buddha on the side walls of the verandah date from the fifth to sixth centuries.